The Chinatown Storefront Library transformed one of Boston Chinatown’s vacant, commercial, street-level spaces into a temporary public library. Operating from October 2009 through January 2010, the project created a memorable event for Chinatown, while providing a selection of urgently needed services for a community that has been without a library since 1956. The library offered: books, Internet access, newspapers, a children’s reading area, and a mix of programs and activities—all visible to passersby on the street. The Storefront Library is not a branch of the Boston Public Library, nor is it intended to be a substitute for a permanent branch. The project’s purpose is to use a vacant storefront to demonstrate the potential impact of a library in the neighborhood. It also models how communities can move forward in tough economic times to activate urban space. a physical and electronic community bulletin board. 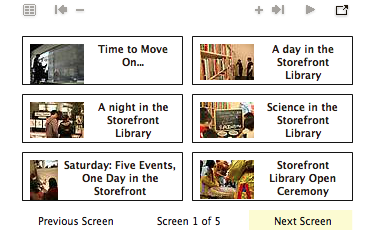 The Storefront Library also offers a variety of events in a highly-visible street-level location. Programming partners, from the US Census to local arts and community groups, are offering programs in the space, as a way to highlight their work and show support for this temporary cultural and civic use of vacant space. Visitors interested in the library’s design and program. In the summer of 2009, Boston Street Lab created a mobile preview of the Storefront Library at local events in downtown Boston. Library staff were on-hand to discuss the project and provide a children’s reading area, photography and calligraphy books for browsing, and free WIFI. 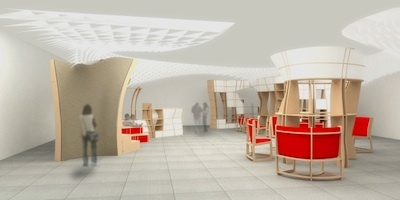 On May 14, June 11, and July 9, 2009, the Storefront Library Project presented at meetings of The Chinatown Coalition. On July 12, 2009, the Storefront Library (mobile) appeared at the Chinatown Main Street Festival. Slideshow available in the Multimedia Player, at right. 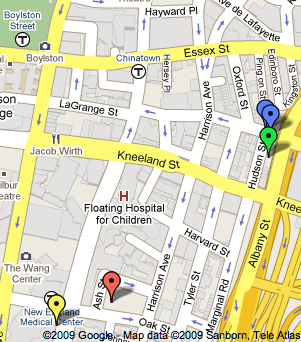 On August 5, 2009, the Storefront Library Project was presented at a meeting of the Chinatown Residents Association held at the Josiah Quincy School. On Sunday, August 16, 2009, the Storefront Library (mobile) appeared at the 2009 August Moon Festival in Chinatown. From August 27-30, 2009, the Storefront Library (mobile) visited Films at the Gate, a free, outdoor chinese-language film series held on a vacant lot near the Chinatown Gate. The Chinatown neighborhood of Boston has been without a branch of the Boston Public Library since 1956, when the library was closed and demolished to make way for the construction of the Central Artery. Chinatown has remained one of the few communities in Boston without its own neighborhood branch library, in spite of strong community support. Chinatown is primarily a pedestrian community, with many elderly residents and working parents with children. Traveling to other libraries is difficult, and there is no other street-level space offering the services typically found in a neighborhood branch. In 2001, the Chinese Youth Initiative of the Chinese Progressive Association started a campaign to bring a library back to Chinatown. This led to the creation of a broad-based advocacy group called Friends of the Chinatown Library. In 2007, the City of Boston commissioned the Chinatown Library Program and Siting Study which determined the program and sites preferred by the community. Since the study’s completion date in June 2008, the economic picture for all City-initiated projects has darkened, and there are no current plans (or funding) for moving forward on any of the study’s conclusions. For best results, right-click (control-click) the links above and save PDFs to your computer. 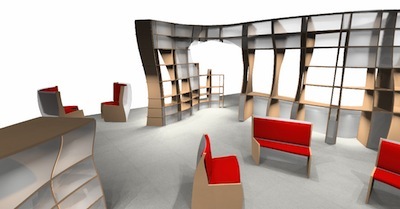 The Storefront Library was produced by Boston Street Lab. Contact project staff here.